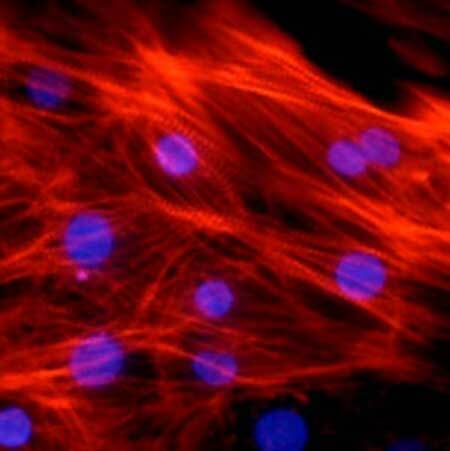 (Nanowerk News) Cell models from stem cells serve an ever-increasing role in research of cardiac dysfunction. Researchers at the Technical University of Munich (TUM) have succeeded in producing cells which offer new insights into properties of the heart. They installed a molecular sensor into the cells which emits light, and not only makes the cells' electrical activity visible, but also makes it possible for the first time to quickly identify cell types ("Subtype-specific promoter-driven action potential imaging for precise disease modelling and drug testing in hiPSC-derived cardiomyocytes"). "Our development solves several problems which had made working with such cell models difficult," said t Dr. Daniel Sinnecker, Cardiologist at TUM's Klinikum rechts der Isar. Laboratory-produced heart cells still pose the problem of how one can best measure electrical activity. In the past, microelectrodes were most commonly used in order to directly determine the cells’ electrical signals. This procedure, however, is quite tedious, and can only be used on a small number of cells. In addition, not all heart cells are alike. All heart cells are able to contract at their own cyclic rhythm, and to forward electrical signals to neighbouring cells. Yet, the cells which form the various structures of the heart, such as the atria, the chambers or the sinus node, i.e. the ‘pacemaker’ of the heart, differ significantly from each other, for example in their action potentials. These are variations in electrical voltage between the inside and outside of cells which form an electric signal that controls the excitation process in the heart and thus its contractions. Daniel Sinnecker and his team described a possible solution for both of these problems in their article in "European Heart Journal." Instead of attaching microelectrodes to cells, the scientists used biological sensors. These are built from fluorescent, i.e.luminous, protein from deep sea jellyfish. The DNA which contains the "construction plans" for these sensor proteins is inserted into heart cells, which then produce the sensor proteins. When the altered heart cells are stimulated with light at a specific wavelength, they produce light at a different wavelength. The precise color of the returned light depends on the voltage difference between the cells' interiors and exteriors. One can therefore measure and record the action potential of individual cells using a special camera.